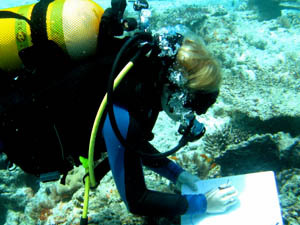 I study coral reefs living in a stressful world. I am interested in the combined impacts of multiple stressors on coral reefs, and particularly the impacts of fishing and coral bleaching on coral communities in Kenya and the Western Indian Ocean. I am also investigating how changes in corals affect reef fish and fisheries, and the potential socioeconomic impacts on food security in coastal fishing communities.